This week's episode is going to be a little different. Instead of looking at the pricing models of a SaaS business, Peter and I take some time to review the pricing pages and strategies of three different charities: the American Cancer Society, Preemptive Love Coalition, and the ASPCA. All three organizations do a lot of good but to facilitate donations, they also need to focus on the success of their businesses as well. How they present their cause to potential donors can have a direct impact on their bottom line. Peter and I break down what people think about donating to nonprofits and charities on a monthly basis. We dig into the data and find some surprising and, honestly, troubling patterns regarding human psychology and what causes donors are willing to pay more for. Being able to tell a compelling story helps each organization connect donors with a cause. But where a strong value proposition gets donors through the door, all three charities don't do a very good job of making it easy to complete the donation process. Once each organization attracts their potential donors, they need to focus on pricing page design and usability to make it simple to complete the transaction. 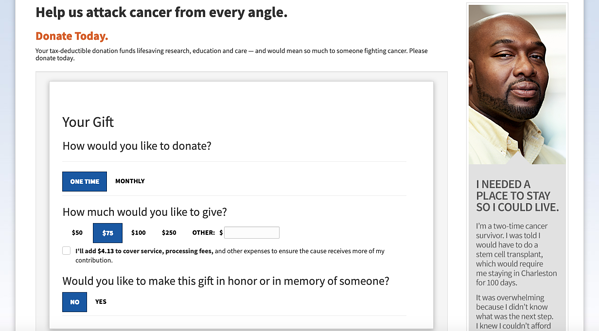 The American Cancer Society (ACS) gives website visitors at least ten different potential choices before moving forward with the donation process. This choose-your-own-adventure-style pricing increases the potential for choice paralysis and will end up hurting the ACS in the long run. 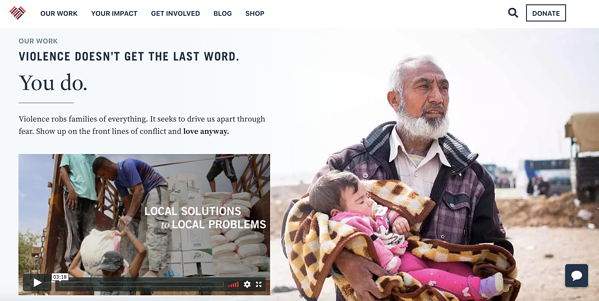 What they do well, however, is include a story in the sidebar that humanizes the transaction, which helps donors connect with their cause on a personal level. We see this on the ASPCA's donation page as well. The ASPCA offers less choices, with only six options, but that pared-down menu suffers from the same kind of confusion as the ACS. There's also no option to set up a monthly recurring donation, which is a huge lost opportunity. The carousel on the right-hand side of the page does give them a way to showcase more stories to potential donors, which is a great tactic for increasing emotional buy-in. 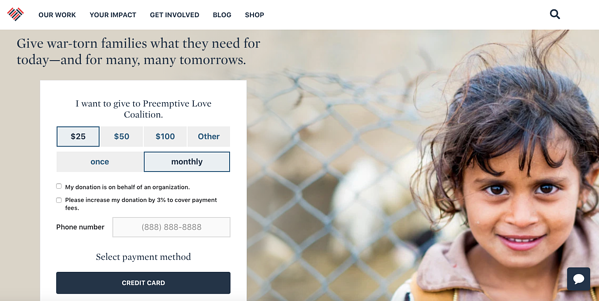 The Preemptive Love Coalition (PLC) is hurt by too many options as well, but they have a better overall grasp on how their website experience impacts donations. Preemptive Love Coalition pares down the available choices, with options for three predefined amounts, as well as the ability to customize a donation amount. And they set the default for monthly donations, which is a subtle psychological cue to the donor that this option is the standard. That can also potentially boost monthly recurring revenue (MRR) for their donors, which gives PLC a way to predict their donations over time. While none of these pricing pages are that bad, if we look at them from a more business-minded perspective, there are definitely ways to optimize. I'd start by simplifying the different donation tiers and hone in on what people are actually willing to pay for each cause. This targeted segmentation will definitely improve the overall experience on their site. These three organizations focus on very different causes, each needing to connect with people on an emotional level to solicit donations. The ability to showcase their good work in a way that resonates with potential donors is very important. In the same way that non-charitable companies need a strong customer engagement strategy, these organizations need to ensure that their donors are engaged with their cause. We surveyed 9,837 charitable donors and found that how these stories are told, and through what medium, have a direct impact on how much donors are willing to pay. 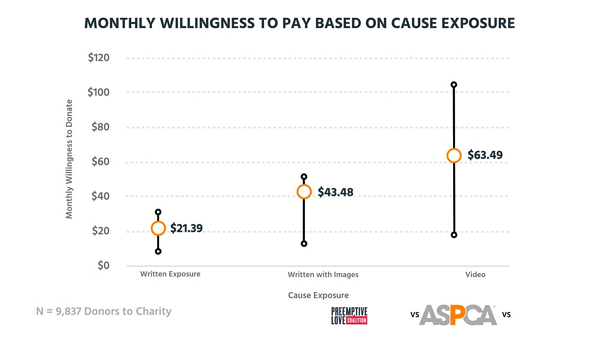 When donors are exposed through the written word alone, their willingness to pay averages at $21.39. Add images to those stories and that more than doubles to $43.49. If video is the primary method of exposure, that flexes up to $63.49, with a much bigger range that can reach over $100. They use a pared-down page design that focuses potential donors on the story PLC is trying to tell. This is even more important for them, as each cause has a different overall willingness to pay. When we asked the same 9,837 donors to state their willingness to pay for each organization's core cause, and calculated it in aggregate, PLC's core cause - helping refugees - came in at the low end of the spectrum with $14.86. 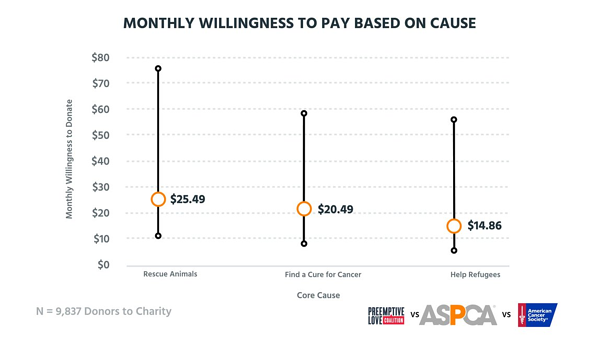 Rescuing animals was highest at $25.49, with finding a cure for cancer just under at $20.49. While there are many more factors that go into each different person's willingness to pay, it speaks to how human beings connect with different causes. Where the ASPCA could easily bring in high-value donations, the PLC will have a much harder time at the upper ranges. That's why PLC's focus on video is so important. Each organization needs to understand that it's all about connection and how donors are affected by the cause. Something like animal abuse or cancer is closer to most Americans than refugees from a war-torn country, and the data shows that this proximity needs to be considered when structuring tiers for donation. When we look at the kinds of features that donors look for in a charitable organization, we see similar patterns as well. The features offered at different donation levels inform how a donor thinks about their contribution. Underpinning everything is a direct connection with the story and understanding of how contributions impact the cause. To see what kind of features were most enticing, we asked those 9,837 donors what they preferred and plotted it against their overall willingness to pay to see where there were opportunities. 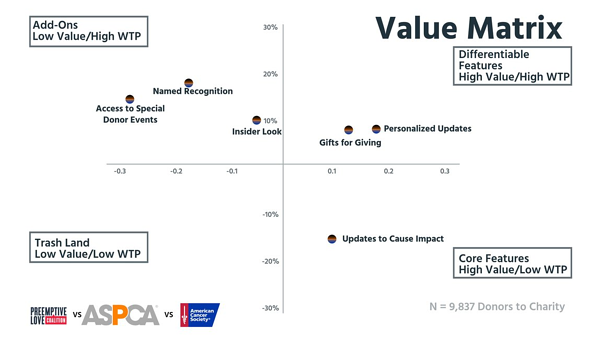 It's no surprise that Updates to Cause Impact ended up in the Core Features quadrant of this value matrix; that's ostensibly what donors are paying for with their donations. It gets more interesting once we cross into the Differentiable Features and Add-Ons sections. Something like a Personalized Updates helps an organization stand out, which makes sense considering how that kind of direct conversation puts the donor closer to the cause. The Gifts for Giving feature also helps set the organization apart, which is probably why companies like PBS and NPR are so successful in their donation campaigns. Reciprocity is a strong motivator even if the gift is something simple like a tote bag. That said, we don't see this kind of gifting strategy employed by any of the three organizations. The Add-Ons quadrant mirrors this idea of reciprocal giving as well with Named Recognition and Access to Special Donor Events netting the highest willingness to pay. While not many people are interested, those that are like the idea of being seen as a part of the solution. Such a clear feature preference breakdown supports the idea that these organizations really need to know their buyer, or donor, personas to optimize their pricing strategy. With the big ranges in willingness to pay, more targeted segmentation in their donation tiers could help boost donation amounts or frequency. That, combined with some feature differentiation related to those things in the Add-Ons quadrant, would go a long way to helping their respective causes. Some basic restructuring of their donation tiers will help boost conversion for each organization we looked at today. By narrowing their options to a more targeted strategy, they'll make it easier for donors to connect with not only the cause, but the organization behind it as well. With a few tweaks to their respective websites as well, the American Cancer Society, the ASPCA, and Preemptive Love Coalition can all help donors see an increased value in their organizations. Now it's time for you to do your part! When you share this episode on social media using the #PPT, we'll donate a dollar to each of these charities. That's $3 for every single retweet, Facebook post, or LinkedIn share.